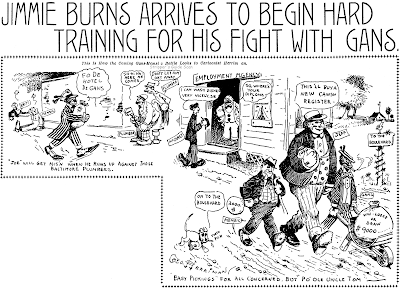 Wednesday, September 11 1907 -- Before Jimmy Britt's welts have even begun to heal Joe Gans is already training for his next fight, scheduled for September 27. This contest will be against a not particularly distinguished opponent, George Memsic. 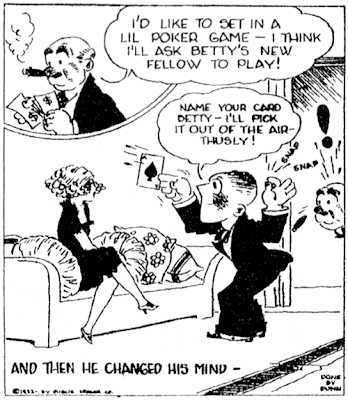 Memsic also fought as Jimmy Burns and both names are referenced in this cartoon, making for a little confusion if the reader wasn't up on the aliases (aliai?). Many fighters of this era went by pseudonyms. Sometimes it was to get the crowds on their side (thus the common use of Irish names for fighters who had no such heritage), sometimes fighters took on variations of the names of other popular boxers. "Joe Gans", for instance, was the stage name for at least three different boxers. Who the Baltimore plumbers are I haven't a clue. Friday, September 13 1907 -- The Hassayampa Club, an organization of Arizona's big movers and shakers, holds a club outing to Los Angeles. The 'reunion' includes a day of various waterborne athletic conntests followed by meetings and festivities in the evenings. At the meetings one of the hot topics is whether Arizona should press for statehood. Beginning March 21 is a new episode in "The Saint," distributed by New York Herald Tribune Syndicate. Despite the fact that Leslie Charteris, the author, has published 27 volumes of the Saint's adventures. This episode has the Saint in an entirely new role. He's to be a gigolo on behalf of a Virginia planter, whose problem is to keep his beautiful and reckless daughter from falling for a no-account adventurer. The Saint will, with this episode, appear in Sunday color pages, starting March 27. The art work is by Mike Roy, who does his work at his Long Island home. Both Charteris and Roy have traveled, which is well for the authenticity of the background as a Charteris story often switches from New York to Miami to Bombay. An interesting local promotion in connection with the feature was devised by the Iron Mountain (Mich.) News. A full page Yeadon cartoon carried the congratulations of other artists in the syndicate field. On an adjoining page were the messages of local advertisers, admiring Bunyan, and extending best wishes to the artist-creator. A statement from the superintendent of schools led off the promotion page, attesting to the accuracy of the "magnitudinous feats of Paul Bunyan." Charles H. Coll, Jr., 58, creator of "The Shadow" and "Myra North, Nurse" comic strips and former art director of Philadelphia Ledger Syndicate and NEA Service, January 18 at Upper Darby, Pa.
King Features Syndicate has announced creation of a Special Service division for the purpose of preparing booklets for general commercial use. KFS artists will create cartoon characters especially for use by advertisers. Obscurity of the Day: Was There Ever a Boy Like Barney Blue? Walter Gallaway produced Was There Ever a Boy Like Barney Blue?, a full page Sunday cover feature for the Boston Herald. It always ran as a full pager, a good thing because the title might well have taken up the whole space in half-page format! Barney seemed to be a telegram delivery boy, though today's samples don't have him operating in his professional capacity. Like many of the Boston Herald's features in their 1906-07 incarnation, the art was superb and the plots were either senseless, hacky, or just plain not funny. Gallaway seemed to think that his customary tagline on the strip was a fine grace note, but often it didn't even make sense, as in the top example here. 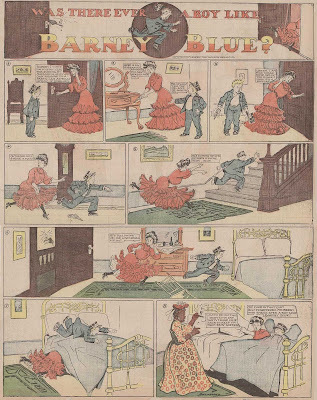 Barney Blue ran from May 6 1906 to March 31 1907 in the Herald, but the feature ran longer in the syndication, as late as April 26 1908 in one paper. My assumption is that the syndicated material was actually reprints from the original Herald run, but I haven't had the opportunity to do a comparison. Gallaway seemed to be stuck on newspapers called the Herald. He left a three-plus year stint at the New York Herald to join the Boston Herald. Barney Blue was his only feature in Boston. He was also a prolific contributor to the satirical magazine Puck. Tip of the hat to Cole Johnson for the sample scans. You're right, the jokes aren't much, but Gallaway's art is very nice. I love these full pages where there was room enough to fill a panel with local color, like the single panel filling the third row. Was there ever a boy who spoke in the wrong balloon order like Barney Blue? Paul Bransom's New York Journal bug cartoons account for the bulk of his newspaper work. Much like his contemporary, Gus Dirks, he concentrated on depicting anthropomorphic bug society virtually to the exclusion of all else. My guess is that the tradition of 'bug artists' probably came from Palmer Cox and his Brownies. Although the Brownies weren't insects, the idea of tiny creatures having a civilization all their own seemed to please young and old readers in turn of the century America. Undoubtedly a weighty tome is just waiting to be written on the psychology of it all. 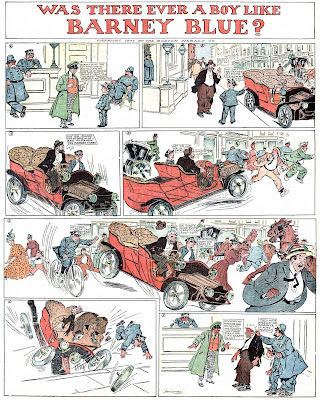 Bransom's bug comic strips formed into a coherent series starting on October 7 1903, when the title In Bug House began to be used on a frequent basis. That title passed out of favor in March 1904, and the next regularly recurring title, Happenings In Bugville, started June 3 1905. In 1906, the year of our samples, Bransom had set his sights on one particular cast member of the bug society, and the final running title became Troubles of the Lover Bug. The series ended on November 20 1906. Along the way several other running titles popped up sporadically, including Bugville Nursery Rhymes and Items from the Bugville Bugle. A case could be made that there are several discreet series here that Bransom should get credit for in the Stripper's Guide index, but tough. The titles on his cartoons were all over the map, and they all had the same subject, even if handled in a number of different ways. The one relative constant in his titles, especially the one-shots, is that they would end "...in Bugville" (A House Fire in Bugville, A Birthday Party in Bugville, etc.) so thus the reasoning behind my blanket title for the series. This was Bransom's last newspaper comic-stripping job. In 1907 he graduated to working for the slick magazines, book illustrating and fine art. Click here for a a good overview of his career. A tip of the hat to Cole Johnson, supplier of today's samples. Here's a short-lived panel cartoon that was syndicated by the Ledger Syndicate. I once assumed that signature, "Done by Dunn", was indicating the work of Bob Dunn, but I was set straight by a family member that anything from that era signed in this manner is by actually the work of Charles J. Dunn. Charles was apparently a mischievous fellow, because his other favored signature was "GAR". His relatives haven't a clue why he chose that pseudonym. And Then He Changed His Mind, an eminently forgettable effort, ran from sometime in 1921 to December 16 1922. "GAR" was a substitue for "GOD" to be used in mixed company, or in family publications, as a componant of the oath; "By god, I swear that..." Note how often we see some stuck fellow in a hundred year old cartoon exclaim, "By Gar!". This is not to say that Mr. Dunn saw himself in such a lofty state or such, it's just that the expression was so commonplace that it had lost it's original meaning, and now was as harmless as the similar "By Gum!" It must have seemed like an irresistable Nome de PUN. Al Jaffee is well-known to Mad magazine fans, but not so many know about his stint as a syndicated cartoonist. 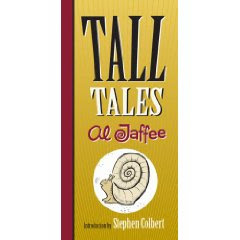 Al Jaffee's Tall Tales ran from 1958 to 1966 (not 1963 as the book states but perhaps the last three years were reprints? ), first for the New York Herald-Tribune, then for Publishers Syndicate. The main selling point of the feature was its shape -- it was a tall one-column cartoon that could fit in a space not handled by other features. The back cover claims that this was the first and last feature ever to use the format -- sorry, no. Duets by Jo Fischer comes to mind, as does Dave Eastman's Carmichael, and many strips could be run vertically in approximately the same space (Peanuts was quite popular in that configuration). Anyhow, factual errors notwithstanding, how's the book? Well, it serves as convincing proof that bad editing can ruin just about any book, even one filled with delightfully demented cartoons. After a chuckle-worthy introduction by Stephen Colbert, we get an informative essay about the strip from Jaffee himself. Then on to the cartoons. As I paged through (rather quickly since it was a pantomime feature), marveling at the inventiveness of Jaffee, I soon started noticing something odd. Jaffee seemed to be forever repeating himself, offering a pair of gags on the same subject, sometimes practically the same gag. Wait a second, that can't be. No, as I slowly figured out, the editor of this book was grouping similar cartoons together. If he had two gags about flamingos, they went on facing pages. Two gags about traffic on a narrow road -- put 'em on facing pages. Two gags about the starting gun for a foot race -- well, you get the idea. Does this editor have some sort of vendetta against Jaffee? Was he determined to ruin the book for readers and make Jaffee look like a repetitive hack? Obviously these cartoons didn't run in this order back in the day. 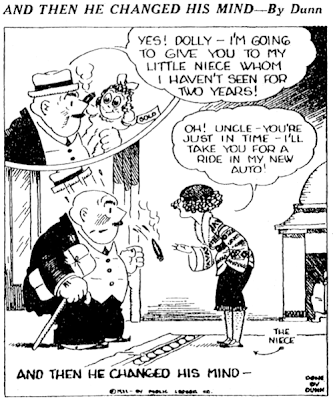 For all we know (the cartoons are undated) they could have run years apart! What could possibly possess this editor to think this was a good idea? Is he a compulsive sorter, did he really think that he was making some positive contribution? Because of this bizarre sorting fetish I could get little enjoyment out of the book. I couldn't enjoy the gags -- all I could concentrate on was what new indignity this editor could do to Jaffee at the next turn of the page. I actually found myself disappointed when the gags on facing pages DIDN'T match. Hey, editor, yer fallin' down on the job! Knowing well how much Craig Yoe loves the work of Boody Rogers, I had to get this book despite knowing that the bulk of it would be comic book stories. 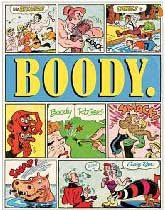 Naturally I would have preferred Boody's newspaper strip work, but according to the marketing for the book, I could enjoy myself with the extras. According to the description, "this beautifully designed tome also has tons of vintage photos and unpublished art (including art from the first modern newsstand comic book that Rogers did in 1935). It all begins with a career spanning fun and fascinating interview with the late Rogers, by editor Craig Yoe." "art from the first modern newsstand comic book that Rogers did in 1935" = a single Rattlesnake Pete page from The Funnies, which was published in 1929 or 1930, not 1935. Okay, so I've obviously been bookjacked here. So what extras do we actually get? Instead of the promised interview, we instead get a three page introduction by Yoe. It's fine, but certainly no definitive brain dump on the life and career of Boody Rogers. 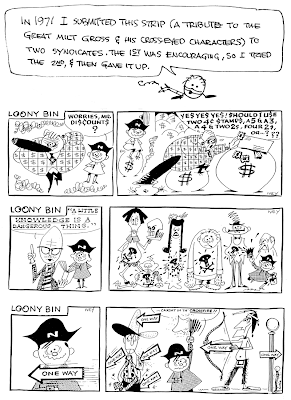 If you want to read some of Boody's looney comic book stories I don't doubt that you'll enjoy the book. But if you're there for the promised extras, prepare to be underwhelmed. Great snarky reviews! What we do need is a reprint of Jaffees Sunday pages of Tall Tales complete with their horizontal top gag. I have a few new ones in color which I'll be showing when I get them scanned. I may reprint your review of the book there. Funny enough Fantagraphics (who also wrongly advertised the Betsy and Me collection as 'complete') would be the most suited publisher for such a book. Oh and what I have seen of the later Tall Tales are no reprints! Jaffee even complains he was forced to use text in the later ones, which cot him his foreign accounts. I seem to recall reading somewhere (not in thew reviewed book) that Jaffee was unhappy about doing the Sunday and thought it didn't really work.